Two inspirational workshops at The Slipper Studio. Imagine a cosy day knitting with natural yarns, learning the all so important basic techniques of knitting. 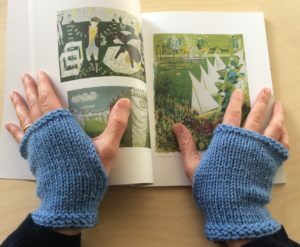 During the day you will learn how to: cast on – knit Garter Stitch – Knit a Purl Stitch, enabling you to produce Stocking Stitch – cast off – sew your project together. 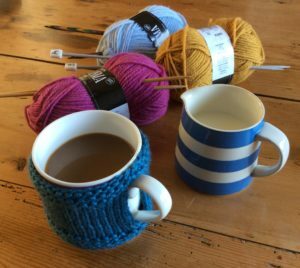 Sunday 12th May, 10 – 4pm, £65 including: a pair of knitting needles, a choice of coloured yarns (100% wool DROPS KARISMA) and a pattern, plus refreshments; just bring your lunch. For further details and bookings, please email me: enquiries@lizwellby.co.uk. Just in case you weren’t able to attend the previous Experimental Printmaking Workshops in March. 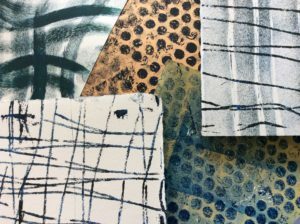 Taking our inspiration from a number of design sources, including Mid Century Design and the work of contemporary printmakers, we will explore pattern through mark making, drawing and collage, with a mixed media approach. 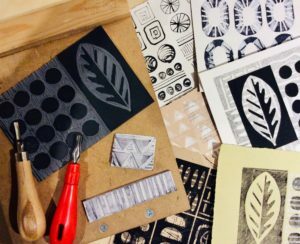 We will create experimental printing blocks and stamps, before developing a series of lino prints. Sunday 19th May, 10 – 4pm, including: materials and refreshments; just bring your lunch.